409 in stock Need More ? Reprint. Illustrations and text on inside covers. Originally published: 2018. 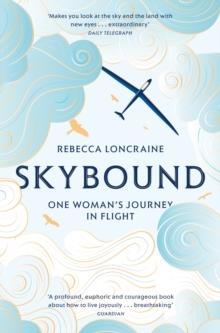 Shortlisted for the Edward Stanford Travel Memoir of the Year Award'Extraordinary' Daily Telegraph'Breathtaking' Guardian Skybound by Rebecca Loncraine is a book for anyone who has looked up and longed to take flight. The day she flew in a glider for the first time, Rebecca Loncraine fell in love. Months of gruelling treatment for cancer meant she had lost touch with the world around her, but in that engineless plane, soaring 3,000 feet over the landscape of her childhood, with only the rising thermals to take her higher and the birds to lead the way, she felt ready to face life again. And so Rebecca flew, travelling from her home in the Black Mountains of Wales to New Zealand's Southern Alps and the Nepalese Himalayas as she chased her new-found passion: her need to soar with the birds. She would push herself to the boundary of her own fear, and learn to live with joy and hope once more.